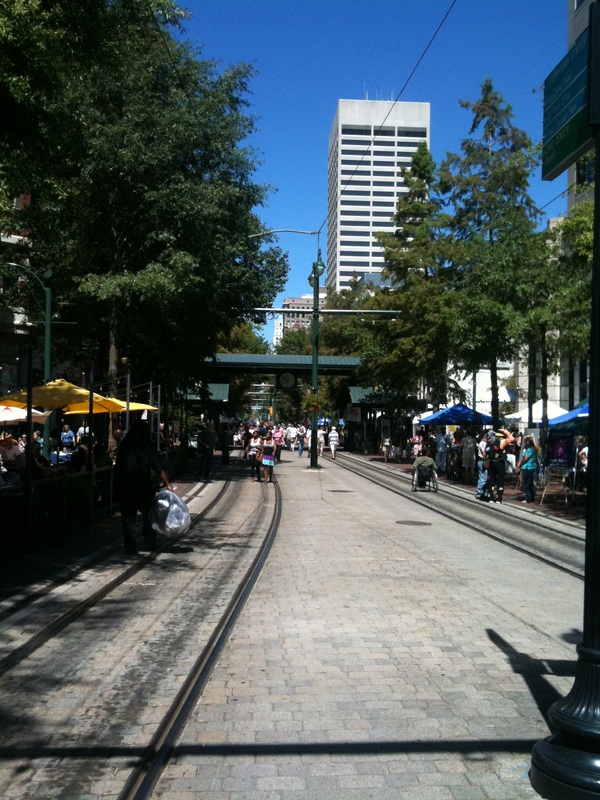 Every Labor Day weekend in Memphis is the wonderful, and free, Memphis Music and Heritage Festival downtown on Main Street between Peabody Place and Gayoso. 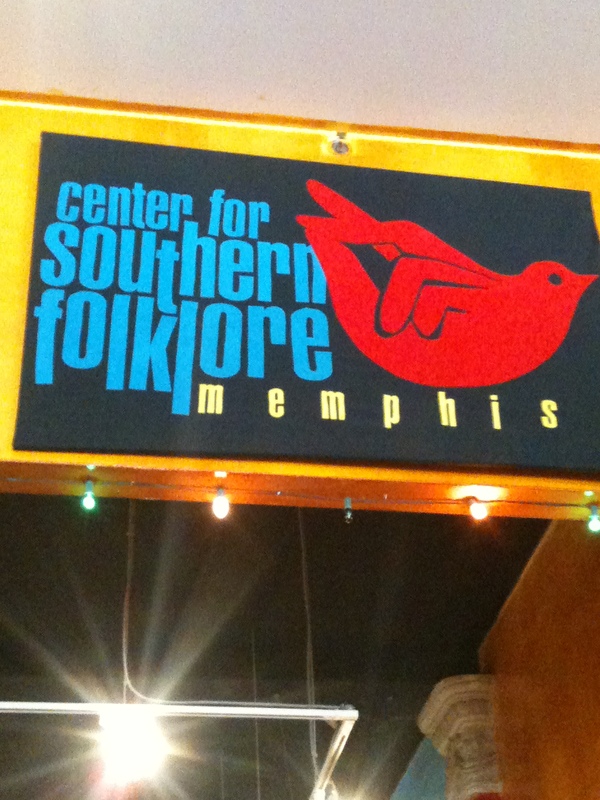 The Center for Southern Folklore puts on this free festival that celebrates Memphis’ rich heritage and music. All types of music is represented from local musicians, such as R & B, Country, Alternative, Rockabilly, Rock, etc. 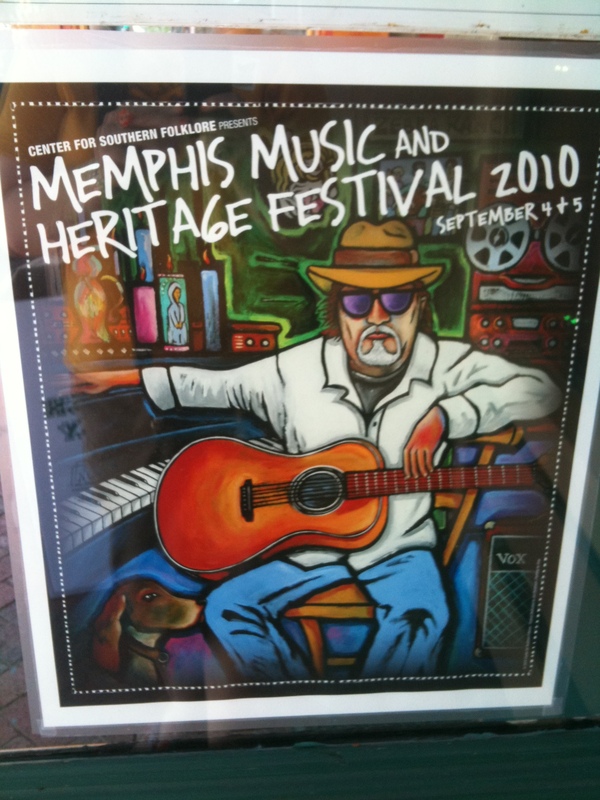 This year’s festival was dedicated to Memphis legend Jim Dickinson who died last August. 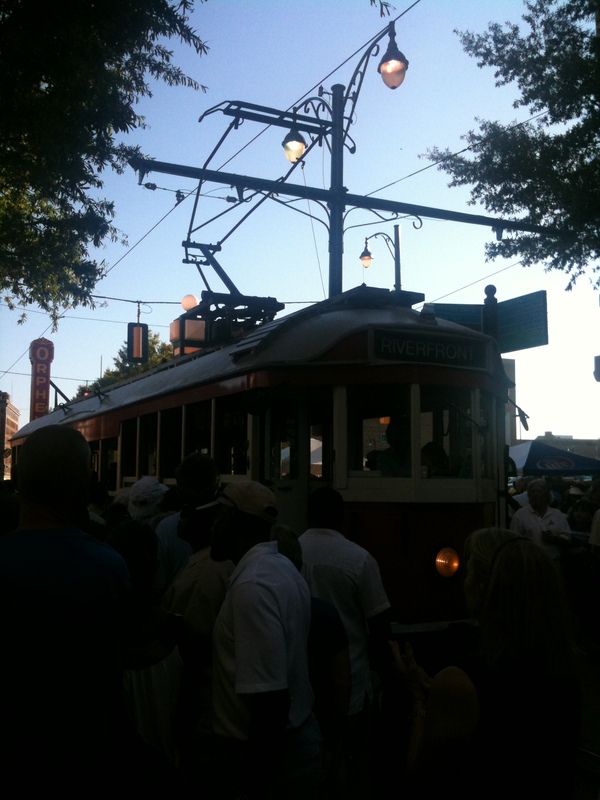 I arrived at the Memphis Music & Heritage Festival just after 1:30, parked at the Orpheum and walked down Main Street checking everything out. I donated a few bucks to keep the festival free. 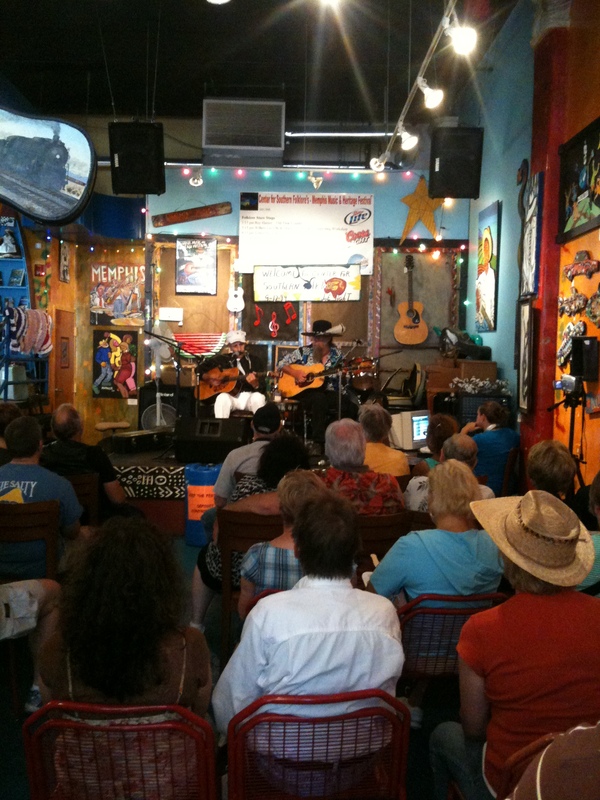 I went to the Center for Southern Folklore Store and caught the last 2 songs of Roy Harper, an 82 year old country singer who was really good. Nancy Apple was up next. I met and got to know Nancy a little last year at this festival. 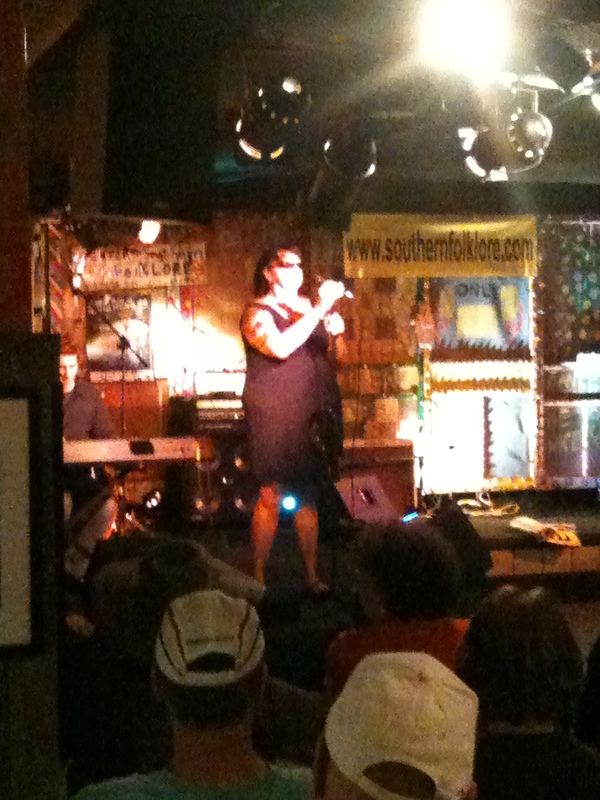 She has become my favorite performer in Memphis. She is known as the Queen of Twang, but I think of her as rockabilly. She even opened with Wanda Jackson’s ‘Let’s Have a Party.’ Nancy also played ‘Moonlight Over Memphis,’ ‘Delta Moon,’ ‘Elvis Loved His Mama’ (one of my favorites) and ‘Voodoo Woman.’ It was a great performance! She played with Robert Mache. I really do need to get out to more of Nancy’s performances. Nancy Apple plays every Sunday at 6pm at Central BBQ on Summer Ave. 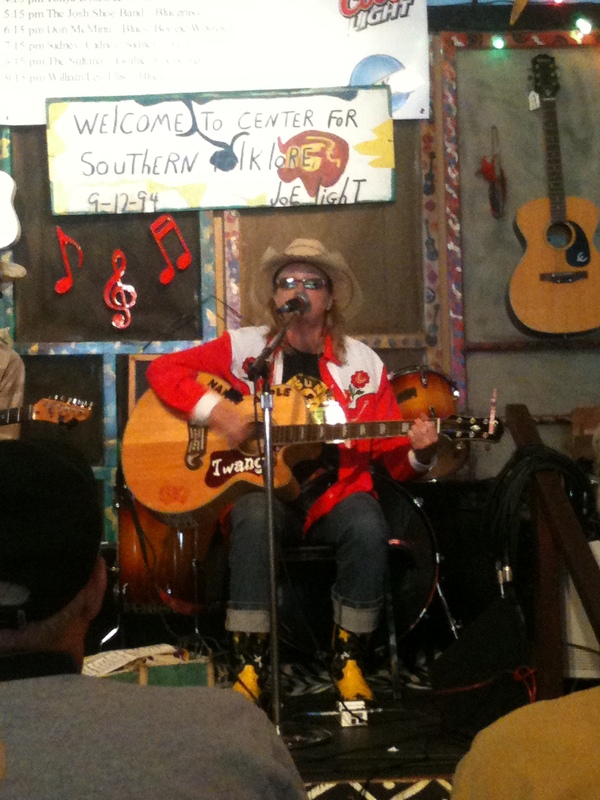 I went to the Center for Southern Folklore Hall next to see Barbara Blue, who is a powerful blues singer. I only stayed for a couple of songs before my stomach got the better of me. I hadn’t eaten since breakfast and smelling the food cooking at the cafe was making my mouth water, so I went to Kooky Canuck’s for lunch. I had fried green tomatoes, a portabella mushroom sandwich, sweet potato fries and sweet tea. Yummy! But I should have stayed at Barbara Blue’s performance longer because apparently Nancy Apple played a song with her. After lunch while walking by the Tennessee Arts stage at Gayoso and Main, I caught one song by Sweet Angel, a great R & B artist, but it was a good one. 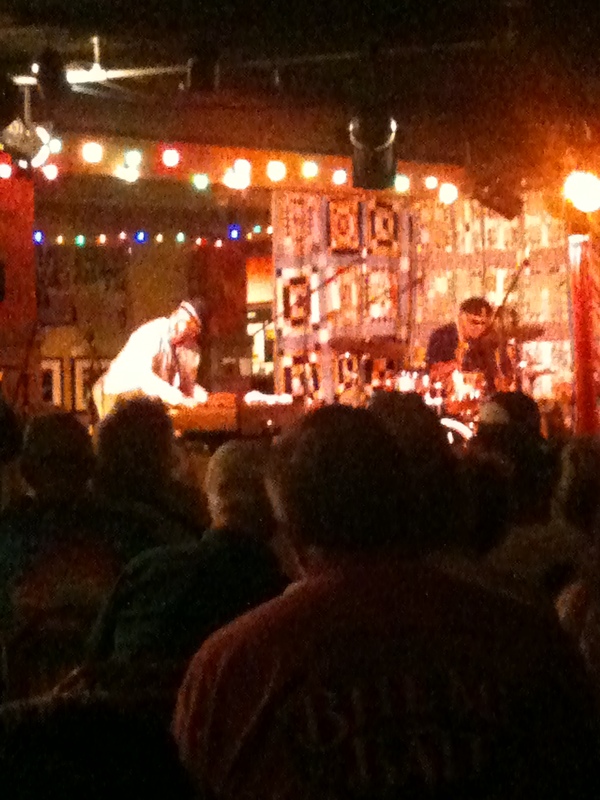 I went back to the Center for Southern Folklore Hall stage because I noticed there was a boogie woogie band playing, and thought I would enjoy that. As I got closer to the stage, I started to run a little because it sounded like Jerry Lee Lewis was playing – but it was The Kattawar Brothers. They were fantastic! Just piano, drums and vocal, but some of the best piano playing I have ever seen – and I’ve seen Jerry Lee Lewis several times. 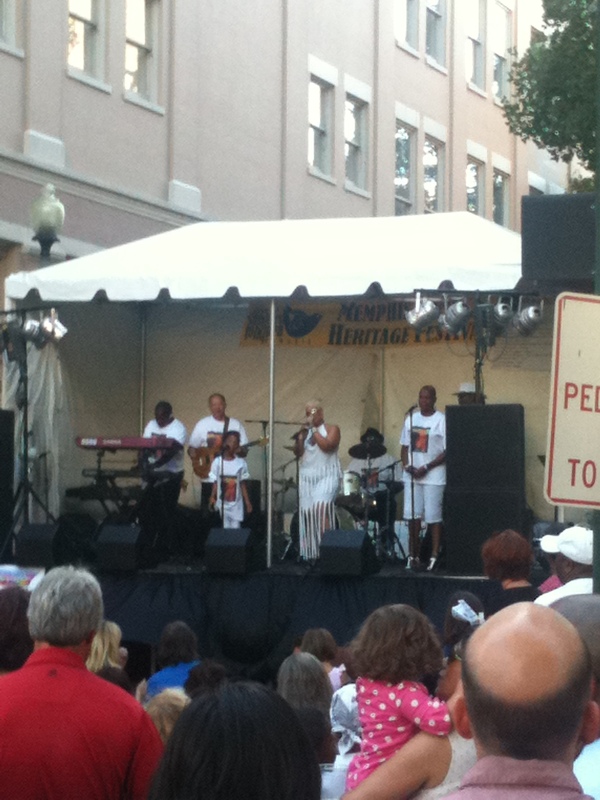 I then made my way down Main Street to Peabody Place where Elmo and Shades were playing the ArtsMemphis stage. They are a great blues band full of legendary Memphis musicians who recorded at Stax, who played on ‘Shaft’ and who toured with James Brown. Next on the ArtsMemphis stage were the Bluff City Backsliders, which I had seen before at the ArtsMemphis Bravo kickoff party where the band was nice enough to let me sit with them while I ate. 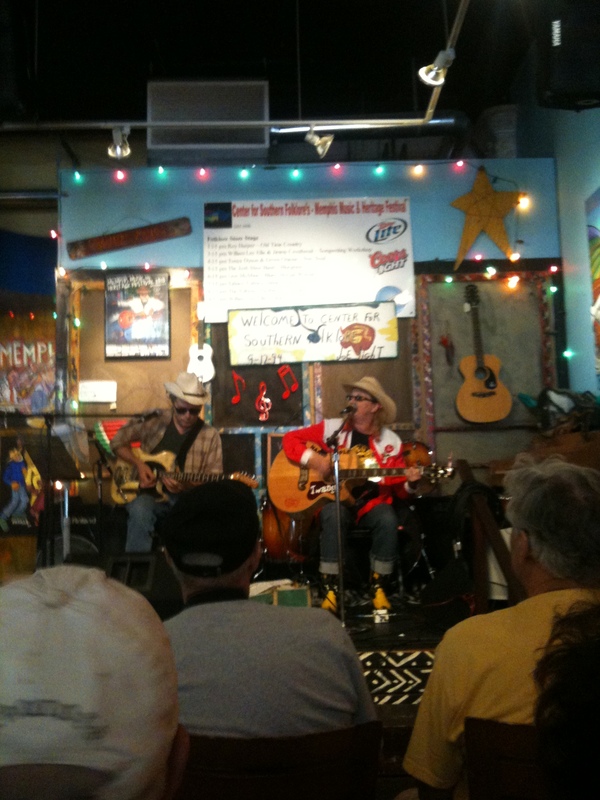 They are known as a jug band, but I see them more as a cross between country, rockabilly and old blues. They are very entertaining and very unique to Memphis. 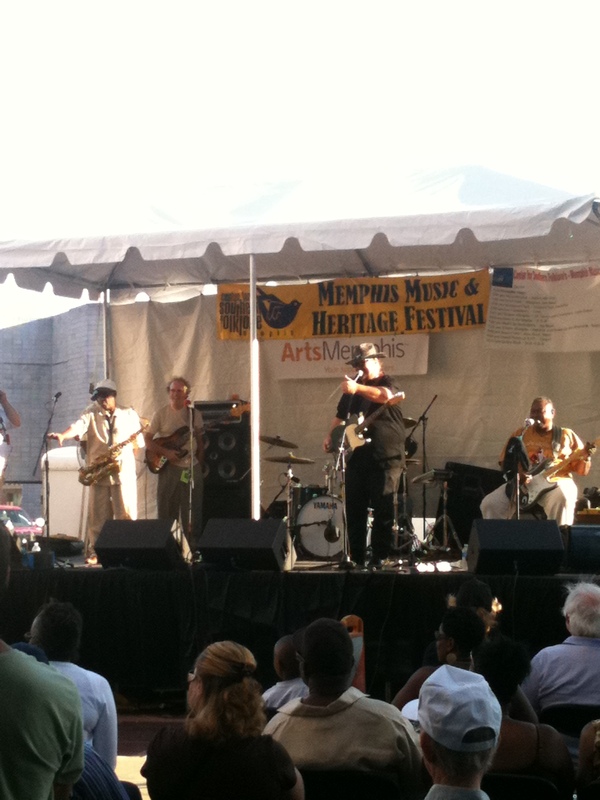 For this performance, Elmo (from Elmo & the Shades) played harmonica with them adding that blues flavor. 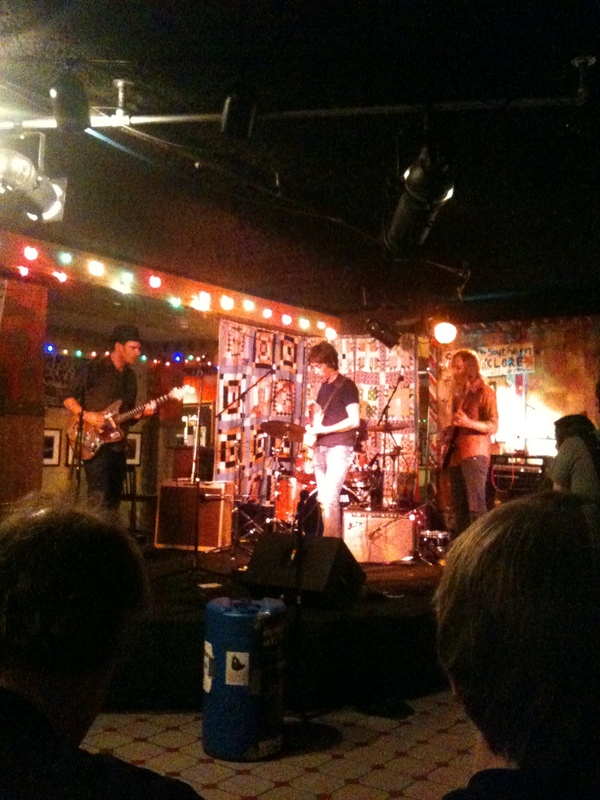 I made my way back to the Center for Southern Folklore hall stage to see Jack Oblivian and the Tennessee Tearjerkers, who I have wanted to see perform ever since I saw them on $5 Cover when I first moved to Memphis two years ago. They are a rock band with sort of a surf music sound. Jack O is hot with beautiful sideburns! I really enjoyed their set and look forward to seeing them again. 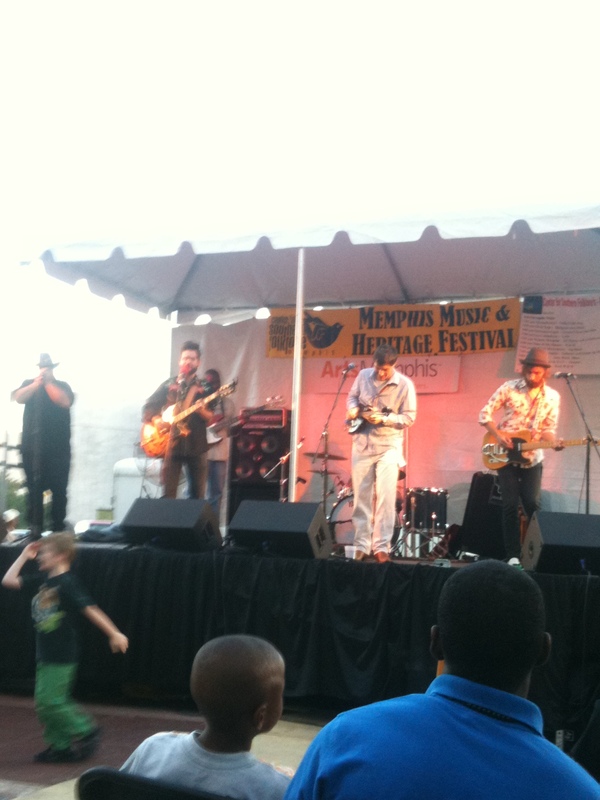 The Memphis Music and Heritage Festival is both Saturday and Sunday. I only went one day, but what a day it was! Seven hours of pure Memphis Music fun!